This reservation policy is now acting as curse in the society. This is creating jealousy and fights between Indians. Reservation should be given to those who really need it. Not every one of us needs it. Today there are many rich people who belong to reserved categories and still taking the benefit of reservation. This is very wrong. And there are also so many people who are below poverty line and didn't belong to reserved category. Those people want to do something but this reservation is becoming obstruction. Many hardworking Indians are migrating from India as they are not paid according to their ability. When we see statistics of any exam we see that number of people who belong to reserved categories are coming forward and the one who belong to category other than reserved are rejected even if they score more than reserved. Today the government wants reserved category people not the people who are hardworking. All are having one brain, two eyes, two hands. 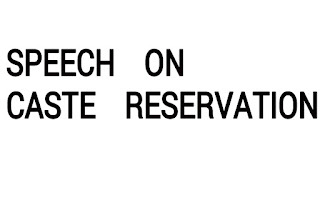 Then why reservation? What will happen if a 40% scorer is becoming a doctor and a 90% one is rejected. The time came when reservation should be banned. This need lot of hard work and unity. A single person cant do any thing. As it is rightly said that united we stand and divided we fall which means till we are united nobody can harm us. And if we are not united then any body can harm us. There should be one caste. This is the best step to remove reservation. Our ministers are trying to uplift India then there first step is to remove reservation as if this reservation is removed then educated and hardworking persons will come in front and directly it will lead to progress. At last I want to say that we should give the importance to hard work not to category.